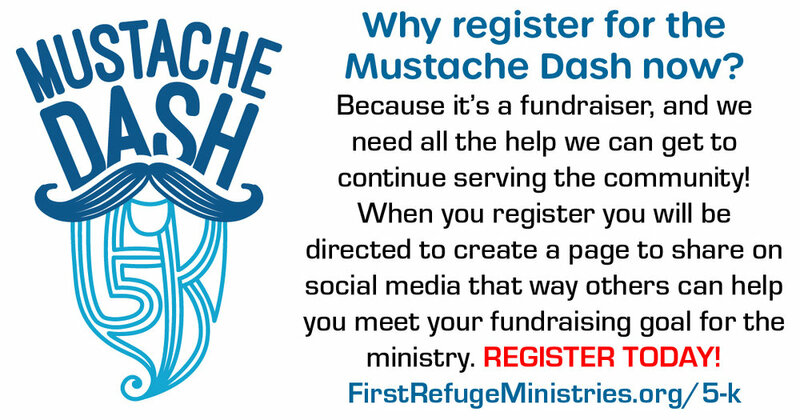 The official page of the 2019 Mustache Dash 5K Benefiting First Refuge Ministries. Due to the severe weather forecast on the day of Saturday the Mustache Dash is canceled. We encourage all paid participants to still come by and pick up your swag bag, shirt, and medal. Thank you for supporting First Refuge Ministries. It's time for the MUSTACHE DASH, and we are going all out this year! We have added fun family events so pay close attention upon registration. We are hosting the annual 5k, but this year we have added a Family Fun Run, as well as a Doggy Dash! Yep, you heard right we are calling all small dog owners to participate in our Doggy Dash. There will be something for everyone at this year's event! Register now and start raising funds with your automatically generated personal sponsorship page, easy to share directly to social media. All proceeds from this event will help fund the ministries of First Refuge. Runners, walkers, strollers and joggers are invited to participate in this family-friendly event. Oh, and in case you were worried about not having a mustache, we provide them! • Automatically generated personal sponsorship page for you to share on social media to help raise money for First Refuge Ministries. • Automatically generated personal sponsorship page for you to share on social media to help raise money for First Refuge Ministries. Yes- your dog will have his/her own fundraising platform and just might go viral! To learn more about the benefits of becoming a sponsor of the Mustache Dash or if you would like to become a sponsor please click below! Use the images below to share the Mustache Dash on Social Media. Click - Save - Share!